EQUIPPED TO SURVIVE (tm) - Techtest Ltd. Compact Voice Capable 406 MHz ELT Avialable in U.S.
Winslow LifeRaft Company has been named North American distributor of Techtest Limited's Series 500-12Y compact voice capable 406 MHz ELT, making this unique emergency beacon availible to consumers. Winslow has already started to install the ELTs on their life rafts. The ELT is also available for purchase separately. At $2974 suggested retail each, it certainly couldn't be described as "affordable," but Winslow reports sales are taking off. Winslow's aim is to eliminate less capable 121.5 MHz ELTs from installation on their product line. Earlier plans to accomplish this using a newly designed DME Corporation 406 MHz ELT came for naught as DME failed to deliver the product as promised, causing everyone involved considerable grief. The ELT is small, 5.9 x 3.4 x 1.5 inches, and pretty light at 21.2 oz. (150 x 87.5 x 37.5 mm, 600 gm). It can be operated either manually or automatically, deploying and transmitting upon inflation of the life raft. Aside from the significant advantages of the 406 MHz beacon over the far less capable 121.5 beacons, this also has the advantage of two-way communications on 121.5 and 243 MHz. Based on a design used by NATO military pilots in ejection seat aircraft, this unit should be able to take anything thrown at it. It's got a bright yellow plastic body and the lithium battery need be replaced only once every five years. If desired, for longer use, a spare battery can carried and be installed in a matter of seconds without opening the case. The beacons is rated at 24 hours at -20C for the 5 watt 406 signal and 48 hours at -20C for the weaker 121.5/243 homing and comm signal. The unit is available either as a portable unit with its telescoping antenna attached to a rotating joint and folding into a recess in the side of the body, or with an antenna remotely connected via a cable for using in life rafts. 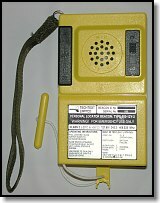 There is a PTT switch and a volume control for the transceiver. No specs available on transceiver transmission range, but we hope to test one of these units in the near future and will update our report at that time. The ELT is COSPAS-SARSAT and FAA TSO C91a and C126a approved as a type "S" survival ELT. With sales of 406 MHz Personal Locator Beacons and Personal EPIRBs still in regulatory limbo, this is the only compact unit readily available to U.S. consumers. As an ELT, it is perfectly legal to purchase.